As the picture above illustrates, Cary Grant and Ginger Rogers made an endearing couple by simply holding hands, something they were wont to do in the two feature films they made together. Their first movie and the movie from which this photo comes, Once Upon a Honeymoon (1942), finds them in the roles of two Americans caught in Europe at the start of WWII. The movie blends comedy, suspense, cloak-and-dagger intrigue, romance, a little whimsy, and ever so lightly the dark and somber face of war. While it does, of course, verge on being propaganda of a sentimental ilk, depicting the sinister Nazis as often little more than bumbling fools who can be outmaneuvered and outwitted by two decent human beings, to its credit the movie also provides a serious and credible backdrop to the travails of two lovers. The movie offers a lament from the heart for the neglected, dispossessed victims of a world view hellbent on neglect and, consequently, atrocity. For everything positive, uplifting, and inspirational that it was to its 1942 audience, Once Upon a Honeymoon also and soberly provides a testament that the devastation left in the wake of these bumbling Nazis was and would be more than the ravages of bombs and guns. 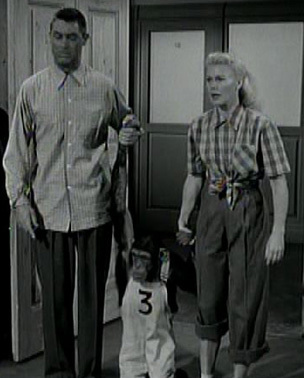 Rogers and Grant’s second and final movie together occurs ten years later in the film Monkey Business (1952). In this vehicle, Grant plays a chemist seeking to develop a formula for a kind of fountain-of-youth cocktail. 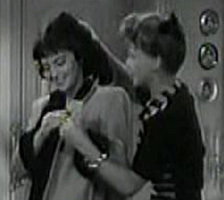 Rogers plays his understanding and sometimes neglected wife. When Esther the chimpanzee escapes her cage in the chemistry lab and inadvertently mixes the formula that the chemist Grant has been unsuccessly trying to create, a touch of serendipity, a little romance, lots of havoc, and classic Cary Grant and Ginger Rogers escapades of silliness ensue. Beyond the teaming of these two very remarkable entertainers in these two films, another connection worthy of note for both films comes via Marilyn Monroe, who plays the part of the quintessential dumb blond in Monkey Business. In 1952, Marilyn is, of course, at the cusp of a career fast rising to much greater and substantive roles. It is not, however, her wonderfully stereotypical performance as the secretary who can’t type wherein the connection occurs. The Marilyn Monroe connection occurs because Marilyn appears in Monkey Business in a supporting role much in the same way that her good friend, as well as her sometimes roommate and acting coach, Natasha Lytess, appears in Once Upon a Honeymoon as the Jewish maid whom Ginger Rogers’ character rescues from the Nazis, a rescue returned in kind when the Jewish maid, with a little bit of the serendipity and silliness we see in Monkey Business, assists Ginger Roger’s character in escaping from the Nazis and a very dispicable husband (played by Walter Slezak). I love Monkey Business!! It’s SO funny and Ginger Rogers and Cary Grant are SO good in it!